Killer Characters: Christmas = Work! I am the owner, head baker, and chief bottle-washer of Victoria’s Bake Shoppe in Rudolph, New York, unofficially known as America’s Christmas Town. For me, the holidays mean WORK. Like any small town shop, Christmas is our busiest season. Not only do I have extra orders of my famous gingerbread (a Rudolph tradition) in the form of cookies as well as cakes and even bread, but shortbread, yule log cakes, fruit cakes (yes, some people still like them) enough pies the weight of which would crash Santa’s sleigh, cakes, bread rolls for the holiday brunch, parker rolls for the big dinner, and on and on… but of course all our regular baking has to be done too. Bread and rolls, cookies, tarts, cakes, muffins, croissants. Then salads, soups, and sandwiches for the lunch crowd. Don’t get me wrong, I’m not complaining. Well, maybe just a little bit. It’s a busy time of the year. And it’s made even busier by my participation in the semi-annual Santa Claus parade. (Yes, we have one in July also). I don’t have to try for the best in parade trophy every year, but being somewhat of the competitive type, I anyway say I’ll never do it again, and then I do. This year my float is the Elves Bakery, and it’s pretty spectacular, if I do say so myself. Don’t take my word for it. I won! Again! Merry Wilkinson looks not at all pleased. Too bad the tractor pulling her float broke down and she was eliminated from the judging, or she might have been a contender this year. I know Merry, she’ll be mad at me for about two minutes and then we’ll remember that we’ve been best friends since kindergarten. No time to revel in my victory. I have to cater the big post-parade reception. I’ve made a special batch of gingerbread for the party. This year we have an honored guest, a reporter from an international travel magazine here to do a big feature on Rudolph. I don’t normally ice my cookies – I think the pure cookie goodness can stand on its own – but I made an extra effort for him. A big piece of gingerbread decorated to look like Mr. Charles Dickens, author of A Christmas Carol. I hope he likes it. I hope nothing goes wrong to spoil the feature article on America’s Christmas Town. 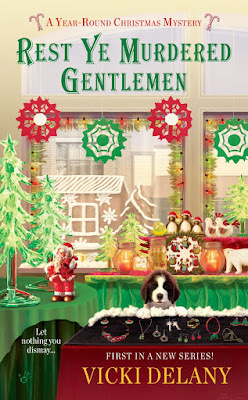 The first book in the Year Round Christmas series from Berkely Prime Crime is Rest Ye Murdered Gentlemen. Rest Ye Murdered Gentleman will be released on November 3rd and is now available for pre-order from Amazon, B&N, and all booksellers. Rest Ye Murdered Gentlemen sounds like a great book to start this series! I am looking forward to reading it. Thanks, Jen. I hope you like it. Definitely want this series! I love Christmas stories! Happy Halloween! I really enjoying reading holiday stories at this time of year. This book sounds really good. So I definitely need to check it out better than just this teaser. Off to go check on it since I love the cover too. Thank you for letting us see you book. You are very welcome. Vicki Delany is also Eva Gates, author of the Lightouse Library series. Love the word play on the song lyric. Looking forward to reading Rest Ye Murdered Gentlemen. Just put in my TBR list. Can't wait to read it. This new series sounds great! I love the Lighthouse Library series so I certainly want to check this one out. Thanks, Renee. That's alwasy nice to hear! Sounds like something good to read! This book sounds really good and I love Christmas mysteries. Sounds like a fun series! Also probably fattening to read. ;) Like Renee, I love the Lighthouse Library books, so I'll be looking for this one next month. I love this newsletter and would love to win the print book of Murder on St. Nicholas Avenue. Thanks and Happy Halloween. Great fun reading this newsletter. Already pre-ordered my copy!! Cant wait. Happy Halloween all!! I'm so excited to read this and is released the day before my birthday, too perfect! I'm so excited to read this and it's released the day before my birthday, too perfect! A new series by a favorite author (Eva Gates) - yay! It sounds terrific! Your books make my mouth water and the covers are gorgeous! Thanks for the chance to win one! Thanks so much for your kind words everyone. I hope you enjoy Rest Ye Murdered Gentlemen. It was certainly a lot of fun to write. Christmas theme, bakery and tasty foods, mystery...what more can you ask for?